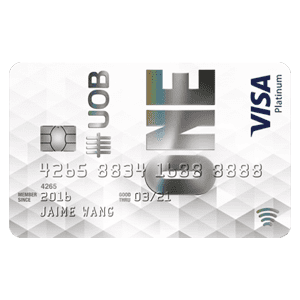 It is a very good credit card i almost for $60-80 every month but the condition of having to spend $500 is a pain to many and you will be tempted to spend more just to qualify. If you spend more than $500 then it is a good card to consider. Also they do charge annual fee on subsequent year, need to be mindful to call in to waive. OCBC has the worst customer service. They have very strict fee waiver policies for their credit cards. And, if you accidentally forgot to pay your cc bills on time or if there is a technical delay over inter-bank payments, they will charge you late payment. If you do not hit the minimum spending $900/mth, you will be charged annual fee and you can't waive it off. So, no matter how much you try to earn the rebates and meet the 360 account conditions, it will be all gone with these strict annual fee and late payment charge. Also, it is known that the OCBC CSOs should not waive fee liberally. So, avoid at all cost!!! 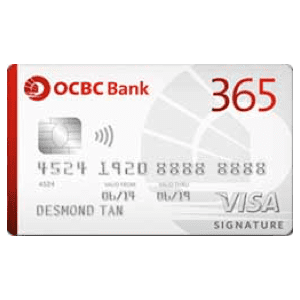 Held OCBC 365 for a couple of years, changes conditions of cashback multiple of times. The deal breaker is effective on 1st Oct 2018 where they removed 3% online spending and change to $800/mth min spending to qualify. Time to move on. Decent product and generally fuss free- I use this mainly for dining out with friends (so minimum $600 is much easier to hit) and other misc things like groceries, grab rides etc. Was using this card previously before I switched to DBS Live Fresh. 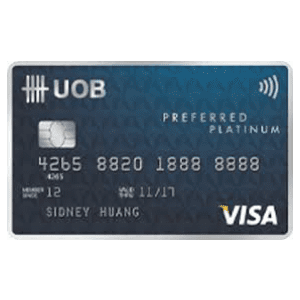 If you have a OCBC 360 account, you should definitely use this card to hit the requirements for interest. I like that the card has 6% weekend dining and discount at Esso! the rebates for this card used to be good but it’s getting worse and worse now. They keep changing the terms and conditions and it’s frustrating. So much for #staytrue. Please stay true to giving your customers the best value and rebates and stop hiding behind this marketing crap. Annual Interest Rate: The effective interest rate is 25.92% per annum and is subject to compounding if the monthly charges are not repaid in full. Cash advance fee: A Cash Advance Fee of S$15 or 6% on the amount withdrawn, whichever is greater, applies for each Cash Advance transaction. Cash Advance interest of 28.92% p.a (minimum S$2.50) will be calculated on a daily basis and levied on the amount withdrawn from the withdrawal date until full payment. Interest subject to compounding if the monthly interest charges are not repaid in full. To be eligible for the above cashback on Dining, Petrol, Online, Grocery, Recurring Telecommunications bill and Medical (where applicable), Cardmembers must spend a minimum of S$800 based on posted transactions in a calendar month on the OCBC 365 Card. The spending can be aggregated between the Principal and Supplementary Cardmembers and is only valid for retail transactions. Cashback are computed based on 2 decimal places per transaction without any rounding. Cashback earned will be credited into the Principal Cardmember’s card account in the following month based on posted transaction. Cashback earned by a Supplementary Cardmember will be credited to the Card Account of the Principal Cardmember. OCBC reserves the right to vary the percentage of the cash rebate or revise the minimum spend required without notice at any time or from time to time. Cashback are awarded only for retail purchases made on the Card. Annual card fees, Cash-OnInstalments, Instalment Payment Plan, PayLite, tax payments, interest, late payment charges, Cash Advances, Balance Transfers and other fees and charges, and bill payments made via Internet Banking or any AXS network will not be taken into account in the award and computation of cashback. In relation to spend incurred on any EZ-Link and Transit Link transactions posted in a Principal Cardmember’s credit card account (“EZ-Link spend”) in a relevant calendar month, such a Principal Cardmember is only entitled to claim up to 0.3% cash back from an amount not exceeding S$200 of the total EZ-Link spend for that relevant calendar month. For the avoidance of doubt and notwithstanding anything to the contrary, the total cash back a Principal Cardmember may be entitled to receive in relation to his/her total EZ-Link spend for a relevant calendar month shall not exceed S$0.60. To be awarded the 3% cashback on Medical spend in any calendar month, Cardmembers must also be the OCBC Bank Child Development Account Trustees for the whole of that calendar month. Retail purchases charged to the Card but yet to be posted to the Card Account will not be taken into account in the computation of cashback to be awarded. Refunded retail purchases will be deducted from the relevant monthly billed amount for the computation and award of cashback. Any reversed portion of cashback will be reflected in the Billing Statement of the following month. OCBC may retract, deduct and/or re-compute any cashback awarded if any Cardmember fails to effect due payment for the Card Transactions, abuse the cashback programme as deemed fit by the bank or if the Card Account is terminated by a Cardmember or the Bank. Any cashback awarded will be reflected in the Billing Statement provided on a monthly basis. Such Cashback will be automatically offset against that month’s billed amount. 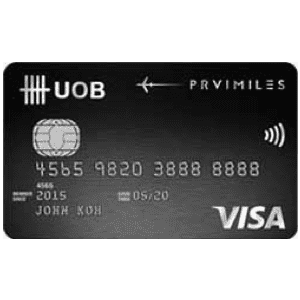 OCBC reserve the right to replace the cashback with another item or kind of reward as we may determine without notice at any time or from time to time. OCBC reserve the right at any time without giving any reason or notice to the Cardmember to deduct, withdraw or cancel any cashback awarded to you without liability. Cardmember will not be entitled to any payment or compensation whatsoever in respect of such deduction, withdrawal or cancellation. OCBC may, at our sole discretion and without notice, suspend the Card at any time. The crediting of cashback to Cardmember’s Card Account will be entirely at our discretion and we shall not be liable or responsible for any loss or damage suffered or incurred by any Cardmember in connection with the Card. 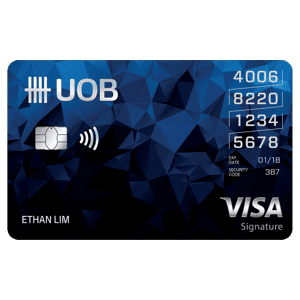 OCBC's decision on all matters relating to or in connection with the Card (including the Scheme) shall be final and binding on all Cardmembers. In the event of any inconsistency between these Terms & Conditions and any brochure, marketing or promotional material relating to the Card, these Terms & Conditions shall prevail. All rebates will be awarded in accordance with, among other things, the relevant recognised universal merchant category codes designated by the relevant merchant. 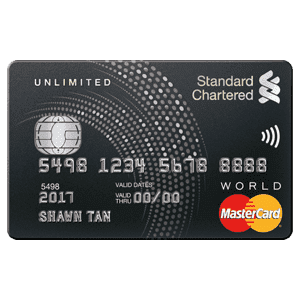 As such, OCBC Bank shall not be liable in any way whatsoever to reward any rebate or compensate any Cardmember for any losses, liabilities, expenses or claims suffered or incurred by any such Cardmember if a relevant merchant classifies its universal merchant category code inaccurately and thereby causing the inability of OCBC Bank to reward any rebates to any Cardmember.